When life gets busy and our day-to-day responsibilities dominate our schedules, it can be difficult to spend quality time with our significant other. Devoting time to our loved ones and nurturing our relationships is a very important part of keeping the romance alive, so if you and your sweetheart are in need of some New Mexico weekend getaway ideas, we’ve got you covered. Chimayo is a historic village located just 35 minutes north of Santa Fe in the Jemez and Sangre de Cristo mountains. The peaceful setting and plethora of cultural and historic attractions make Chimayo one of the best spots for romantic getaways and vacations in New Mexico. Just to get you started in your planning, here are some of our favorite romantic things to do in New Mexico that will have you and your sweetheart falling in love all over again. The ultimate romantic getaway awaits you in the village of Chimayo. Find even more fun things for the both of you to enjoy when you request your free copy of our Vacation Guide. This handy planning tool is filled with all the best recommendations for nearby outdoor activities, restaurants, shopping, attractions, entertainment, and more. Founded in the 17th-century by Spanish settlers, Chimayo, NM is a colorful and inviting village nestled in the northern New Mexico mountains. It’s quintessential charm and rich history has also captivated visitors from all over the world. As you wander through the village and chat with the locals, you’ll discover that many of the people that still reside in this town are descendants of the land’s original settlers. 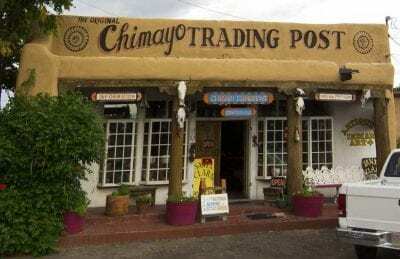 They carry on the traditions of their ancestors that put Chimayo on the map including blanket weaving, tending to fruit orchards, producing red and green chile, and raising cattle. There are also several attractions that you won’t find anywhere else that further immerse guests in the culture of Chimayo. Here are just a few that you won’t want to skip. El Santuario de Chimayo: While this small Catholic church may seem unassuming from the outside, its role in local folklore is what makes it famous. Almost 200 years ago, the El Santuario de Chimayo was the final resting place of a miraculous crucifix that kept disappearing and reappearing to a local priest. It’s also the site in which thousands of pilgrims make their way on foot each Holy Weekend for a handful of the legendary Chimayo Holy Dirt. During your visit to the El Santuario de Chimayo, you are welcome to participate in any of the daily masses or simply take a look around. Chimayo Museum: Formerly a 19th-century home, the Chimayo Museum houses several interesting artifacts, photographs from the 20th-century, and generously donated items. The museum is dedicated to educating the public about the rich history of Chimayo through their rotating exhibits, special events, and a community preservation association. Rancho de Chimayo: This award-winning restaurant is one of Chimayo’s most precious hidden gems and a must for any romantic getaway in New Mexico. Using tried and true family recipes, owner Florence Poulin has created a stunning menu of irresistible Southwestern dishes rooted in cultural influence. After indulging in meals like the Sopaipilla Relleno or Plato Vegetariano, make sure you save room for their tasty desserts or signature cocktails. 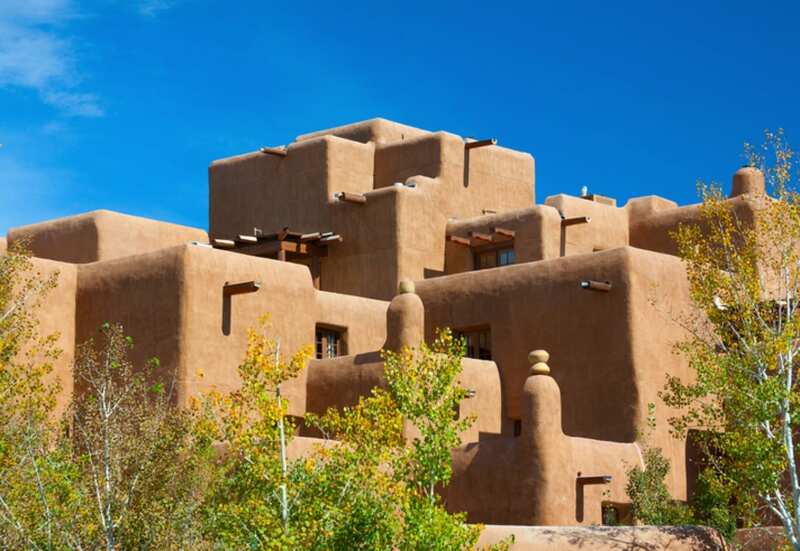 Recognized as one of the top cities in the nation, Santa Fe is the capital of the Land of Enchantment and a must-see destination for your romantic vacation in New Mexico. The city’s stunning architecture and vibrant culture have long served as Santa Fe’s main attractions, but there’s so much more to experience during your visit to this inspiring destination. Whether you spend your day browsing through the eclectic shops and art galleries, satisfying your appetite at one of the world-renowned restaurants, or creating your own adventures along the hundreds of miles of hiking trails, you’re bound to make memories that you’ll always cherish. Here are just some of our favorite things to do in Santa Fe that you may want to for yourself during your romantic weekend getaways. Hiking Trails: As one of the top hiking destinations in the U.S., Santa Fe never fails to impress both avid and beginner explorers alike. There are literally dozens of hiking trails to choose from with miles upon miles of wilderness just begging to be discovered by you. Since the difficulty levels of these trails vary, you’ll be able to choose the one that is ideal for the both of you and your stamina levels. No matter which trail you choose, we guarantee you’ll be rewarded with stunning views of the northern New Mexico mountains and the Rio Grande Valley. Romantic Restaurants: Santa Fe’s dining scene is one of the most respected in the nation, and for good reason. There are many flavors, cuisines, and dining atmospheres delight in, so whether you want to surprise your significant other with a romantic candlelight dinner or a fun and unique casual meal, you’ll have plenty of options to choose from. Shopping: If your idea of a relaxing vacation includes shopping for the perfect souvenirs and mementos from your trip, you won’t do any better than Santa Fe! Most of the shops, boutiques, and galleries in this city are fully stocked with items you won’t find anywhere else. Canyon Road is a local favorite and a hot spot for art lovers to find incredible gifts from more than 100 art galleries. The Traditional Spanish Market is also a grand opportunity to find rare items and authentic artistic traditions that can be traced back over 400 years. Whether you’re planning the best weekend trips from Albuquerque or a sweet getaway that’s not too far from home, we invite you to unwind and rediscover your romance with us at Casa Escondida. With an authentic Southwestern atmosphere and ideal location in Chimayo, NM, we are one of the most exalted bed & breakfasts in our area. Our charming inn suites accommodate guests for short term and long term stays and provide many of today’s modern comforts. While you’re relaxing in your room, you and your sweetheart can spark the romance with a variety of unique amenities including kiva fireplaces, private decks that promote views of the Sangre de Cristo mountains, and beautiful antique decorations. Plus, breakfast is included and features various American and New Mexican selections that will prepare you for a full day of adventures.